Aroid Forum: What in the heck is going on? OK, I pulled off some of these protrusions, but was disappointed to see that there was nothing to dissect. 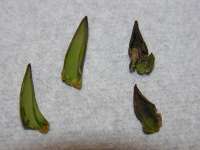 The photo is of the claw shape growths, with them opened up and slightly flattened so I could get an image of their interior. 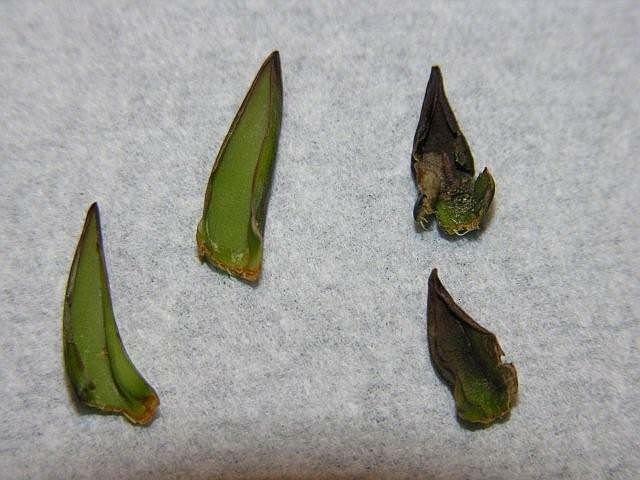 No tiny spadix or capsule developing, only these spathe shaped hoods. The newest inflorescences, of the three currently on the plant, produced the two 'things' in the photo on the left. The rest of this spadix is producing pollen, if that is any help to what is occurring here. Well, I'm just a home-grown botanist, but for me Araceae always tended to be closer to Zingiberales than Alismatales. 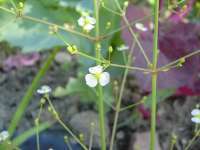 In appendix - a flower of Alisma plantago-aquatica. Totally differently built. Subject: Re: [Aroid-l] What in the heck is going on?